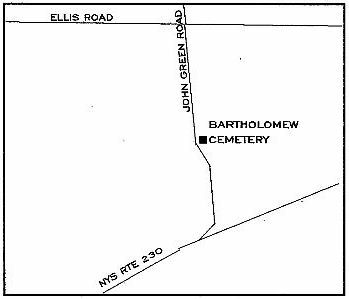 The small cemetery which used to stand by the side of John Green Road is reserved as a burying ground on deeds from the 1830s on, right up to the last sale in the 1940s. It still existed within living memory, and had several stones in it. These were apparently never read and it cannot now be determined whose they were, as the cemetery is completely gone. It is quite evident from the ground where it was located, and its position is pinpointed by the land records. The couple who lived here prior to the first mention was undoubtedly buried here. They are also recorded on the family monument erected by their son in Dundee?s Hillside Cemetery. It is also possible that their graves were actually moved to Hillside after it opened in the 1860s, as so many other graves in the south part of the county were. Another owner of this property, the location of whose grave has never been determined, was William Coolbaugh. His descendants who died here are all buried in Hillside, but the village has no record of his burial there, or his removal after his original burial. For help with abbreviations and conventions, click here.